Bill named his custom Further firstly for the beautiful woods. Secondly, it's a bit of a tribute to Woody Guthrie. As Bill explains, "Woody Guthrie, back in the 1940's wrote 'This Machine Kills Fascists' on his guitars. Inspired by Woody, Pete Seeger writes 'This Machine Surrounds Hate And Forces It To Surrender' on his banjo head. I've always thought it was cool and evocative of the power and unifying nature of music. 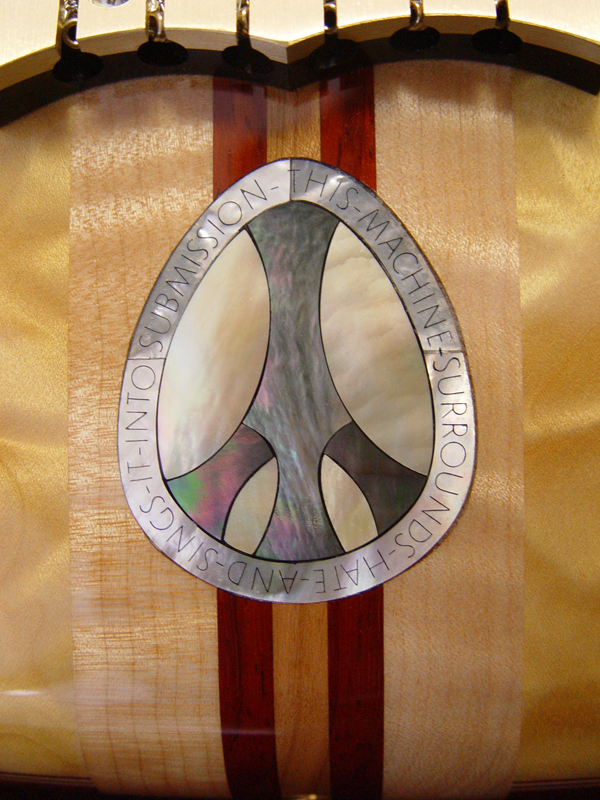 I wanted to make it my own and soften it a little, make it a little less confrontational, so I decided on 'This Machine Surrounds Hate And Sings It Into Submission'"
The Quilted Maple top on Woody is stunning. 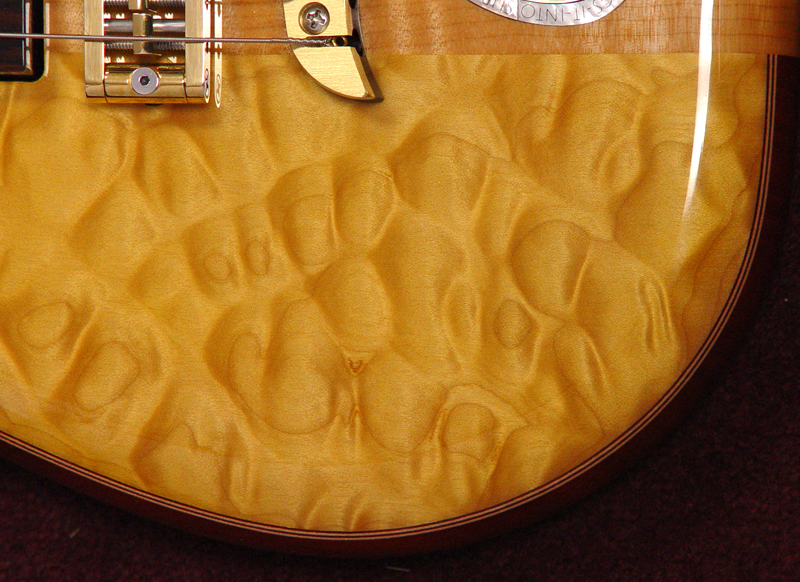 Bob selectively tinted the finish so that only the Quilted Maple has a slight amber tint to the finish. It takes many extra steps, but the end result is worth it. For each coat of finish, the tinted area needs to be masked for the clear parts. When dry, the clear parts are masked so we can spray the tinted parts. We repeat this process until all the color is applied and we're ready for just clear top coats. Bill reports, "The Quilted Maple top looks three dimensional. People see it, touch it, and are surprised to find it is smooth." Usually the veneers on the peghead match the laminates on the body. That's true for Woody, only the positions are flipped. The Quilted Maple veneer is on the back and the Coco Bolo veneer on the front. 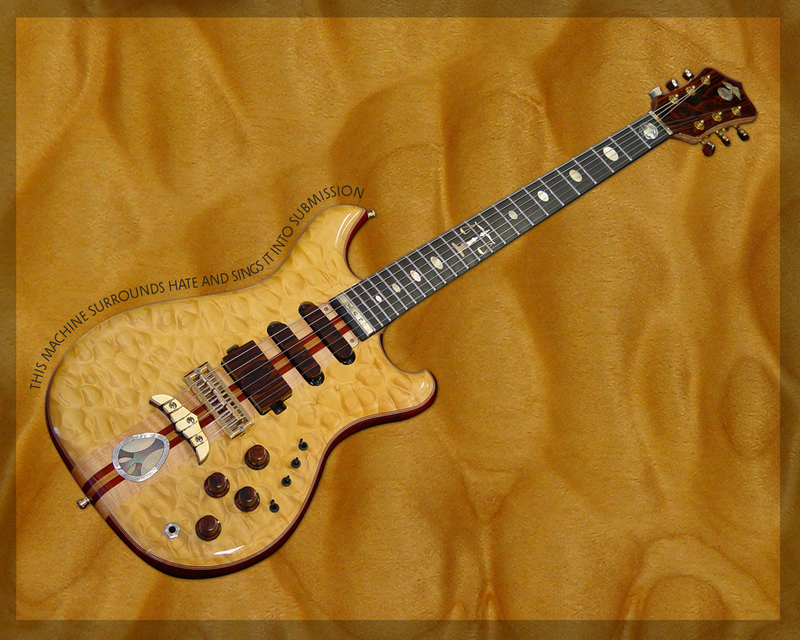 This is a little nod to the old Alembic guitars where the front peghead veneer rarely matches the body wood. 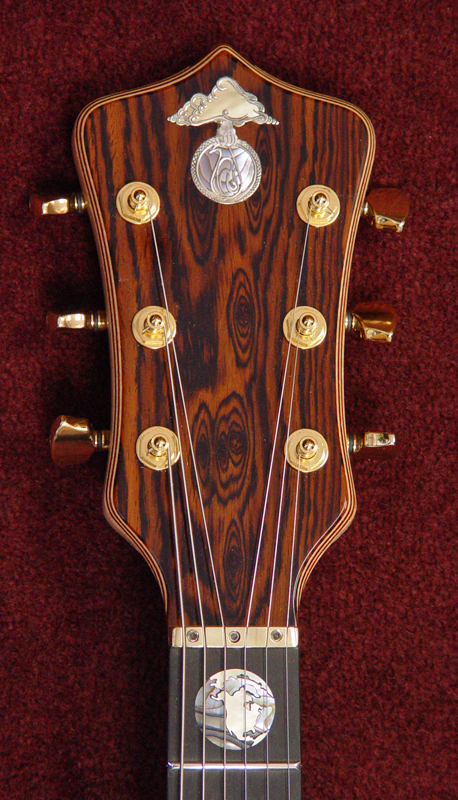 The back of the peghead has an abalone inlay to commemorate California Proposition 215, which Bill co-authored. As a decorative feature, Bill asked us to bevel the edges of both the front and the back of the peghead. 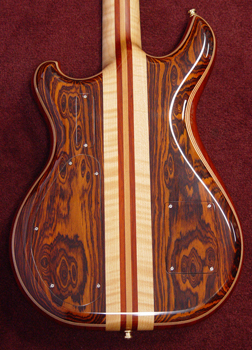 Bill selected the Coco Bolo from stacks and stacks of lumber at the factory. 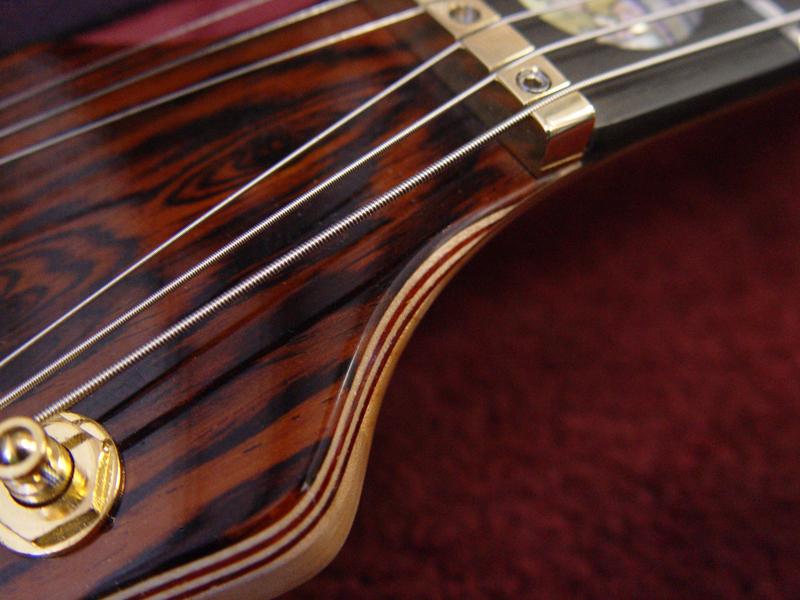 "The Coco Bolo on the back has an amazing swirly pattern with numerous 'eyes'." Bill goes on, "I went through the wood supply at the factory and picked the boards out that eventually became the top and back. Watching the transformation from hunks of dead tree to high art has been fascinating." 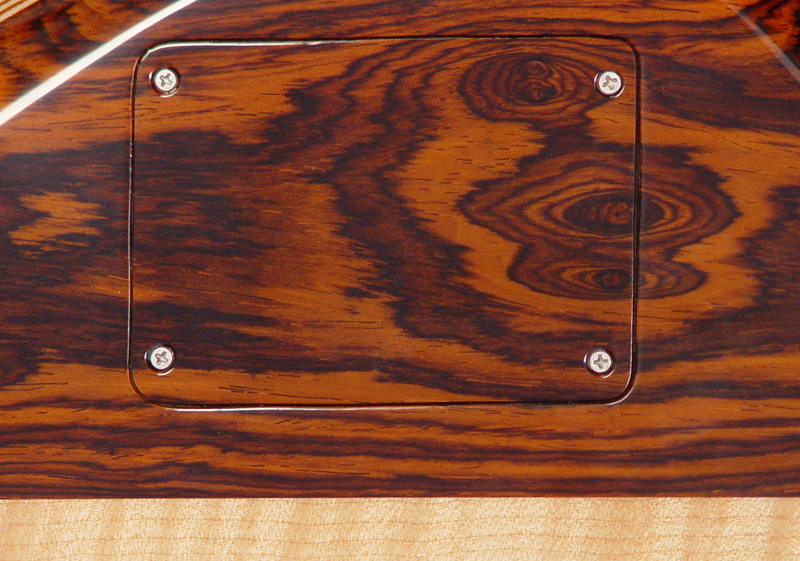 To preserve that swirly pattern, we made the backplates in the continuous wood style. Each plate (there's one for the LED batteries too), is cut from the back laminate before we glue up the body. Then each plate is resawn to produce two to three veneers. We build the plate from these decorative veneers and add other woods like Maple or Purpleheart to build the stack of custom plywood. These wooden plates go through the finish process the same way and at the same time as the rest of the guitar. 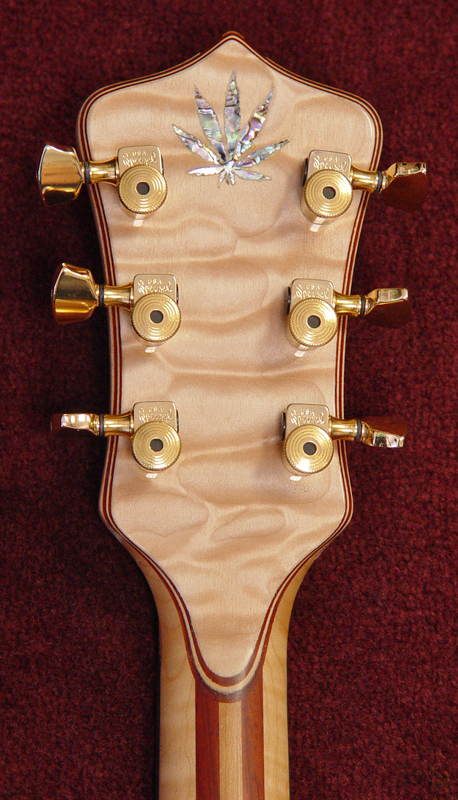 While we were building Woody, another guitar, Owl was also under construction, which is practically Woody's inverse. This was a last minute add-on, but you'd never know unless we told you! 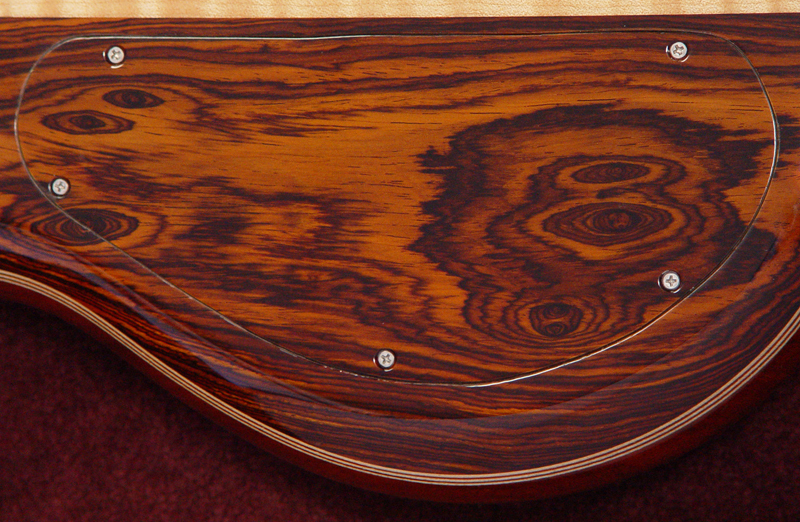 We found some swirly Coco Bolo scraps in the shop and overlaid them on our pickups. 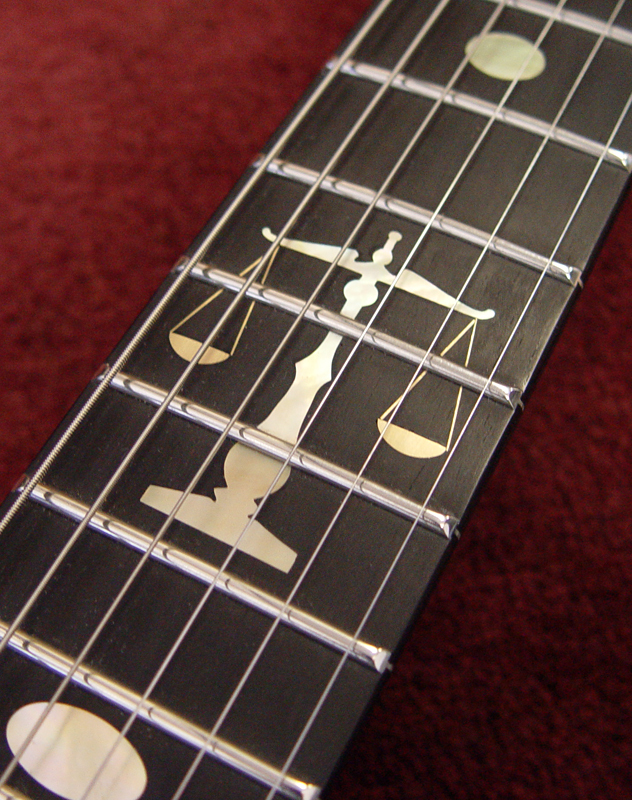 After getting a high-gloss polyester finish to match the rest of the guitar, they look as right as rain. In addition to looking great, it's all about the tone, "I wanted the middle pickup to have a thinner sound," Bill told us. 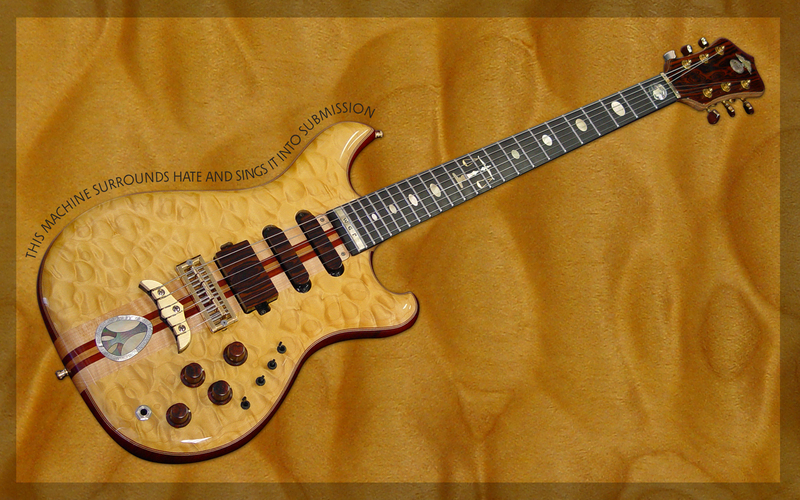 "I use the middle pickup on my Strat for country-tinged material. I wanted to get that same effect from Woody, so I requested a slight deviation from the normal recipe." 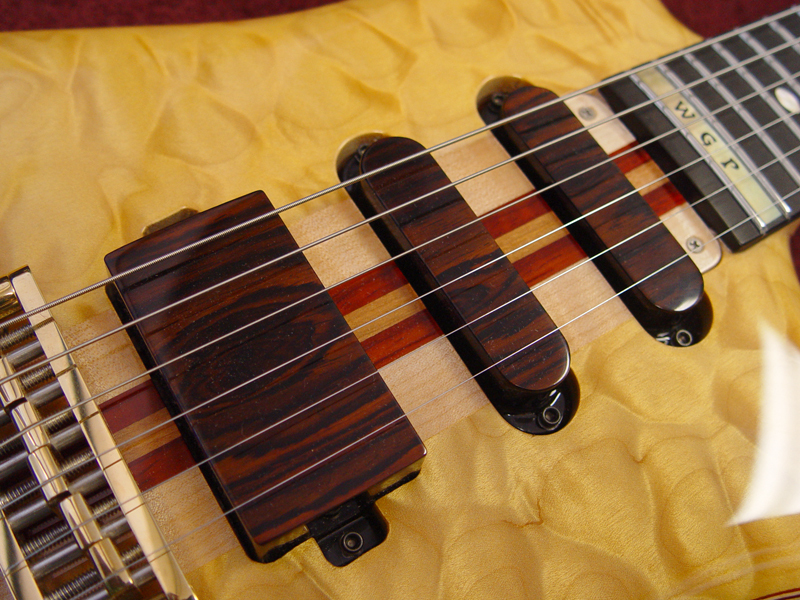 The Further guitar usually has a humbucker shaped pickup in the middle position, but we used a thinner single-coil shaped pickup there instead. 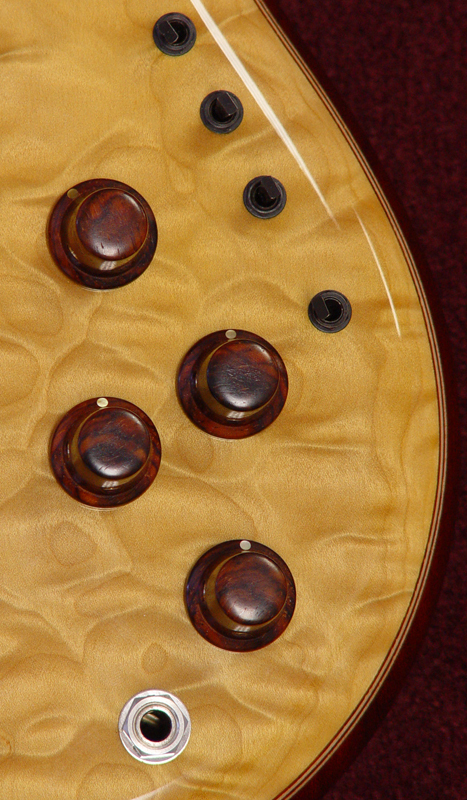 Roger at THG Knobs made these sweet little Coco Bolo hat knobs for Bill's guitar to keep the "Woody" theme alive and well. A small golden mother of pearl dot indicates position. The inlaid logo is sterling silver with abalone and golden mother of pearl. 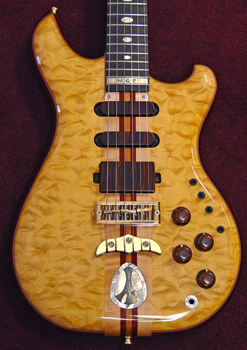 The golden mother of pearl coordinates with the amber tint on the Quilted Maple top and the rest of the inlay work. 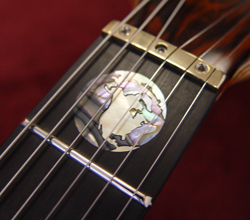 A decidedly California-centric view of the world executed in golden mother of pearl and abalone graces the first fret. 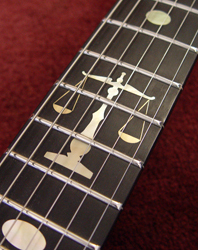 Bill's got a day job, and the "Scales of Justice" are in honor of his profession. They are inlaid in golden mother of pearl with 18 karat gold. 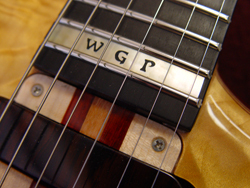 A nameplate at the 24th fret is inlaid in golden mother of pearl. We cut the letters out with a jeweler's saw, and fill the openings with a mixture of Ebony dust and epoxy. This is not engraved, the letters go all the way through and will survive refretting. 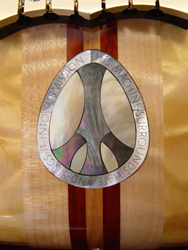 This peace inlay is done in three colors of mother of pearl: white, golden, and black Tahitian. The inscription reads, "This machine surrounds hate and sings it into submission," and is engraved in the font Solpera. "This guitar was my 50th birthday present to myself. 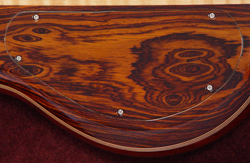 For the last 20 years I've been kiddingly promising myself either a '60's Jaguar XKE or a custom Alembic as my present to myself. As I approached the big Five-0, Senior Management was far more amenable to the Alembic. As expensive as a custom Alembic may be, it is still far less than an E-type Jag! Wolf was always my favorite Jerry guitar. I'd been playing a Strat for the better part of 30 years, so a Further was the obvious choice. "And, of course, another unexpected benefit has been getting to know the wonderful folks at Alembic, as well as making many new friends all over the world through the Alembic Club Forum. I've already started dropping hints to Senior Management about appropriate celebration of my 60th down the road." It's been an honor to build this guitar for you, Bill. Not only do you have impeccable taste, but we've enjoyed getting to know you and call you friend. Looking forward to your Friday drop-bys for many years to come. 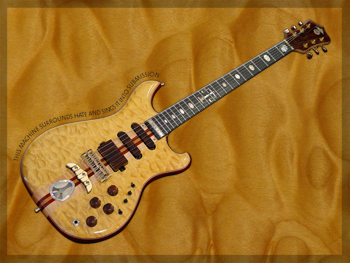 Text and Photographs of guitar © 2007 Alembic, Inc.
Strat is a trademark of Fender Musical Instruments Corporation.